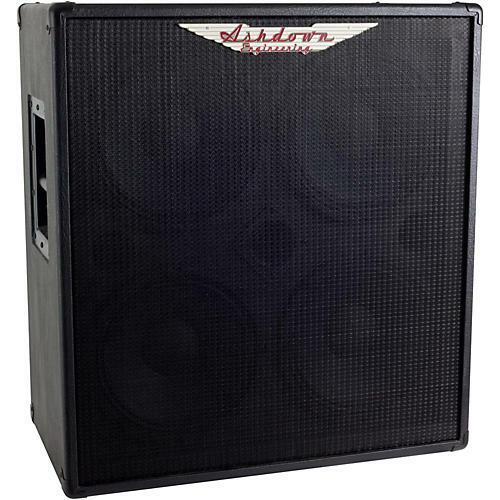 The RM-MAG-410T speaker enclosure is equipped with four Ashdown 10" speakers, as well as a tweeter. It can handle a 450 Watt payload at 8 Ohms, helping to bring the bass to the front of the mix with ease. The Rootmaster Slim cabinetry utilizes an Acoustic Suspension design that maximizes transducer performance by mitigating unwanted resonance. This delivers tighter, more accurate low frequencies, enabling the Rootmaster system to be highly efficient. The all new MAG RM range is the solution for bassists who need affordable and dependable light weight power houses that present real low-end power. Rated at 450W (8 ohms), the RM-MAG-410T brings the classic 4x10" sound to the forefront with add top-end definition thanks to four custom Ashdown 10" drivers and a HF tweeter. Supplied with caster plates - casters available separately. Dimensions: 23.7" x 23.7" x 13.1"